Consider these high points as you plan your trip, ranging from the city's major theme parks to the River Walk lined with restaurants, patios, galleries and shops. The Alamo: The 300-year-old Mission San Antonio de Valero was the site of a pinnacle battle during the Texas Revolution in March of 1836. Here, 189 Texas defenders held off Mexican General Santa Anna's 4,000 soldiers for thirteen days. River Walk: River Walk The San Antonio River is the heart of the country's oldest and most extensive Spanish-colonial water system, having supplied water for the construction of San Antonio's five historic missions. Today, the river still winds its way through the city, defining neighborhoods and offering a landscape of beauty and tranquility to behold from its shady banks. 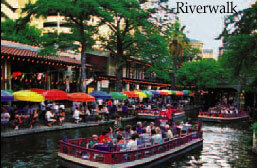 In the city center, the River Walk, or Paseo del Rio, is made up of cobbled walkways, bridges, cafes, shops, restaurants and bars along the river's edge. Its three miles of pathways are a full level below city streets, creating the ambiance of a secluded oasis. The city is filled with culturally significant arts, history, culture, museums and architecture. Information provided by the San Antonio Convention and Visitor's Bureau. 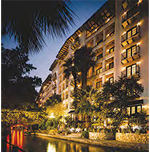 Ideally nestled along the historic River Walk among the banks of the Paseo del Rio in downtown San Antonio, where it is perfectly situated for any visitor seeking to explore all of San Antonio�s extensive range of tourist attractions. Within easy walking distance of the Alamo, El Mercado, La Villita District, Spanish Governors Palace, San Antonio Convention Center and other well-known landmarks. Blending Spanish colonial architecture and European style, guests are surrounded with the romance, grace and charm of a grand hacienda. The Las Canarias Restaurant offers a romantic atmosphere of graceful palms, flowing waters and scenic views.